Safety for pedestrians and drivers was in the spotlight this winter, as Boston endured a record snow fall and everyone stood divided by the tallest of snowbanks. Now, as the snow starts to melt, cyclists are back out too and we want to take a moment to share a few safety reminders. Safety was a priority this winter because Massachusetts saw many car accidents, even though state officials called multiple snow emergencies, and many schools closed, to keep the roads clear. We also saw at least two fatal pedestrian accidents. In Weymouth, a woman was hit and killed by a snow plow as she walked in the parking lot of her condominium complex. A 60-year-old employee at a Medford Whole Foods store also was killed, hit by a snow plow in the parking lot, leaving after his work shift. Safety advocates made progress on protecting cyclists and pedestrians in 2014. This will serve as a strong foundation as we dig out from this harsh winter. In Boston, the city has implemented a truck safety ordinance, requiring that city-contracted trucks use sideguards and other protections aimed at protecting pedestrians and cyclists. MassBike and other safety advocacy groups have also proposed new legislation which may get attention after this hard winter. If passed, the Bike Lane Protection Bill would make it illegal to block established bike lanes. The Vulnerable Road Users Bill would define pedestrians, cyclists, emergency personal and others as vulnerable road users and define a safe-passing distance for them. Pedestrian accidents are too common. On average, in 2013, a pedestrian was killed every two hours and injured every eight minutes in traffic crashes, according to the National Highway Traffic Safety Administration (NHTSA). Walk on the sidewalks whenever possible. If a street only has sidewalks on one side, cross over. If you have to walk on the street, walk so you are facing oncoming motor vehicle traffic. Walk as close as you can to the curb to increase the space between you and traffic. Use crosswalks whenever they are available. Limit use of cell phones, iPods and music players. A common misperception is most pedestrian accidents happen at intersections. That is not true. Some 69 percent of pedestrian accidents occurred at non-intersections in 2013, according to the NHTSA. Some 10 percent of pedestrian accidents happened off the road, in areas such as parking lanes/zones, bicycle lanes, shoulders/roadsides, driveway access and similar areas. In the Spring of 2013, most pedestrian fatalities, 25 percent, occurred between 9 to 11:59 p.m., according to the NHTSA. Another 22 percent occurred between 6 to 8:59 p.m. If you walk at night, purchase a neon glow vest so you stand out to traffic. Even if you never wear it, it pays to be prepared. Wear a bike helmet which meets the safety standard of the Consumer Product Safety Commission and properly fits. Cyclists follow different rules than pedestrians. Go with the flow of traffic, traveling in the same direction as cars, on the right side of the road. Up to two cyclists can ride in the middle of the traffic lane abreast if necessary to stay safe, but you should move back onto the side of the road single file when you can safely do so. State law prohibits biking on sidewalks in business districts. Not every city and town has a designated business district. But assume you are not allowed to ride on the sidewalk or ask the local police department for guidance. Cyclists must use hand signals to communicate to drivers, unless it would be unsafe to do so. You can view this video to learn the proper hand signals. Cyclists should also use a bell to let pedestrians know they are approaching. Watch out for dooring. This is when a car parks and the driver opens their door and hits you as you pass through. It is against the law, but it happens often. You are required to use a white headlight and red taillight or rear reflector if you ride anytime from a half hour after sunset until a half hour before sunrise. If you ride at night, consider purchasing a neon safety vest or clothing so you are more visible drivers.. If you are involved in a bicycle accident, file a police report, even if you do not think you are seriously injured at first. Many drivers may not stop after cycling accidents. If you are hit and the driver does not stop, immediately contact police and file a police report. Look for cyclists and pedestrians at every intersection and yield to them. Drivers must pass bicyclists at a safe distance. If you cannot, you must wait until it is safe to do so or change lanes. Obey all traffic laws and signals. Look for areas designated as school zones. Reduce your speed and take extra care on these roads. Do not park in bike lanes. Do not use your cell phone in the car. It is against the law in Massachusetts for drivers to text and drive, but the best practice is not to use it for telephone calls or other reasons either. It only takes a few seconds to cause a distracted driving car accident. A very dangerous practice is dooring. This is when a driver parks their car and opens the door without looking and hits an oncoming cyclist. It is against the law and violators can be fined. 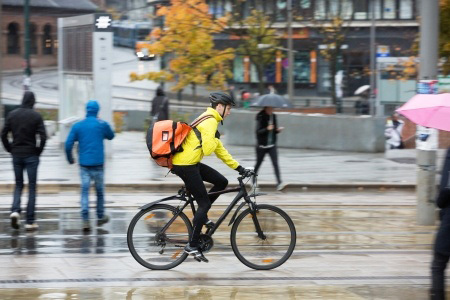 But drivers may also face a steeper penalty, a personal injury lawsuit, because cyclists can be seriously injured and the injuries can require months of recovery and hospital bills. Shifting Gears: Bicyclists and Public Safety. Produced by MassBike, the Massachusetts Department of Public Health and the Boston Police Department. Bike Safety in Massachusetts, Breakstone, White & Gluck. What Every Massachusetts Bicyclist Needs to Know About Car Insurance, Breakstone, White & Gluck. The Boston personal injury lawyers at Breakstone, White & Gluck have over 100 years combined experience handling complex injury claims for clients in Boston, Cambridge, Somerville, Dedham, Newton and other areas of Massachusetts. If you have been injured, learn your rights. For a free legal consultation, contact us at 800-379-1244 or 617-723-7676 or use our contact form.